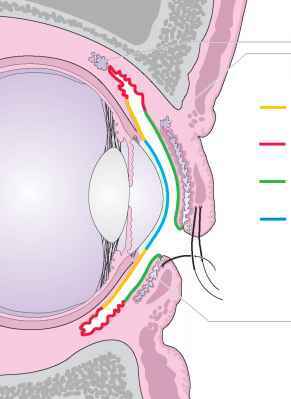 Structure of the conjunctiva (Fig.4.1): The conjunctiva is a thin vascular mucous membrane that normally of shiny appearance. It forms the conjunctival sac together with the surface of the cornea. The bulbar conjunctiva is loosely attached to the sclera and is more closely attached to the limbus of the cornea. There the conjunctival epithelium fuses with the corneal epithelium. The palpebral conjunctiva lines the inner surface of the eyelid and is firmly attached to the tarsus. The loose palpebral conjunctiva forms a fold in the conjunctival fornix, where it joins the bulbar conjunctiva. A half-moon-shaped fold of mucous membrane, the plica semilunaris, is located in the medial corner of the palpebral fissure. This borders on the lacrimal caruncle, which contains hairs and sebaceous glands. 1. Motility of the eyeball. 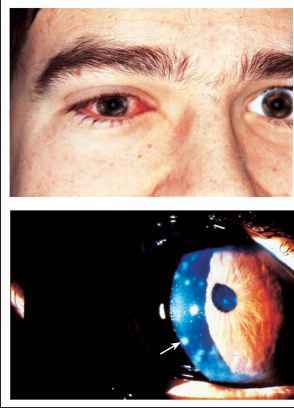 The loose connection between the bulbar conjunctiva and the sclera and the "spare" conjunctival tissue in the fornices allow the eyeball to move freely in every direction of gaze. 2. Articulating layer. The surface of the conjunctiva is smooth and moist to allow the mucous membranes to glide easily and painlessly across each other. The tear film acts as a lubricant. 3. Protective function. The conjunctiva must be able to protect against pathogens. Follicle-like aggregations of lymphocytes and plasma cells (the lymph nodes of the eye) are located beneath the palpebral conjunctiva and in the fornices. Antibacterial substances, immunoglobulins, interferon, and prostaglandins help protect the eye. 68 4 Conjunctiva Anatomy of the conjunctiva. Fig. 4.1 The conjunctiva consists of the bulbar conjunctiva, the conjunctival for-nices, and the palpebral conjunctiva. The surface of the cornea functions as the floor of the conjunctival sac. What is the function of conjunctival sac?